Matt Greenleaf of Portland beams as he hoists the championship trophy after winning the inaugural Downeast Metro Amateur Golf Tournament in 2015 at Bangor Municipal Golf Course. Greenlaw is expected to be among the favorites in the event that begins Saturday. 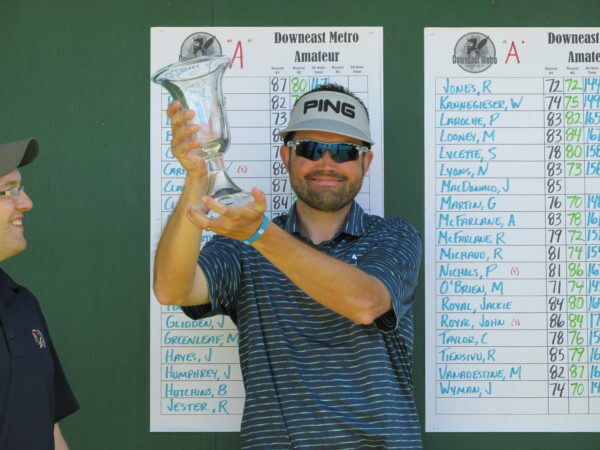 Defending champ Gavin Dugas of Pittsfield and inaugural titlist Matt Greenleaf from Portland will be among the favorites at the third annual DownEast Metro Amateur Golf Tournament. The 36-hole event will be played on Saturday and Sunday at the Kebo Valley Club in Bar Harbor and Bangor Municipal Golf Course. The A and B flights compete at Kebo on Saturday before moving to Bangor Muni for Sunday’s final round. The C and D flights and Ladies division play at Bangor on Saturday before finishing up at Kebo on Sunday. Dugas, who is a sophomore at Husson University in Bangor, fired a 3-under-par 138 a year ago to win by four shots over Brewer native Mike Norris and John Hayes IV of Cape Elizabeth. Dugas finished tied for 16th among 215 players at the NCAA Division III Golf Championship at the Mission Inn Resort and Club at Howey-in-the-Hills, Florida last month. The son of Husson golf coach Mike Dugas shot 72-76-73-75-296. Greenleaf didn’t play in the DownEast Metro last year but shot a 2-over 142 to claim the 2015 title by two strokes over Ricky Jones of Thomaston and Jay Wyman of South Freeport. Another contender will be Deer Isle’s Sam Grindle, who won back-to-back Paul Bunyan Amateur titles in 2014 and 2015 and tied for fourth at the DownEast Metro a year ago at 144. “There are going to be quite a few good players,” said Bangor Muni golf pro Rob Jarvis. He said both golf courses are in good shape despite the rainy spring. “Given the weather that we’ve had, we’re really happy with the course and I’ve heard from people who played Kebo that it is in wonderful shape,” said Jarvis, who predicted that it would take a score of a “few under par” to win the tourney. “The course is going to play soft. So the golfers will be able to throw it at pins [without worrying about it rolling off the green],” explained Jarvis. “The only thing that might be an equalizer is that nobody has been able to play much golf. Some guys would normally have played 20 rounds before the tournament may have only played a half-dozen so far this spring. So they might play a little safer than normal. “Last year, they had been playing for about two months [prior to the tournament] so they were pretty dialed in,” said Jarvis. There were 173 golfers at last year’s event which was a significant improvement over the 2015 inaugural.